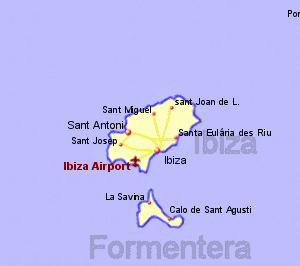 As with it's larger neighbour, Mallorca, Ibiza has been a popular holiday destination for some time. With a landscape of mountains, pine forests, and picturesque beaches, it has also developed as a locatoin for the younger generation who want to dance the night away - literally! Ibiza Town is the capital of Ibiza and a definite clubbing centre but also has an imposing walled old town. South west of Ibiza Town are the beaches of Figueretes, Platja d'en Bossa, Es Cavellent and Ses Salines. The latter getting it's name from the nearby salt lakes which used to provide a very important income for the island. On the south west corner of Ibiza is Cala d' Hort where a rocky islet (Es Vedra) rises out of the sea to a height of 378m. The islet featured in the film "South Pacific" as the island Bali Hai. On the western coast are Calla Conta and Calla Bassa which appeal to families in comparison to Sant Antoni, another clubbing centre with high rise development. The north coast of Ibiza has a number of attractive small bays and the resort of Portinatx. The east coast again has a number of sandy coves and the resort of Santa Eularia des Rui.